"The Night before Christmas is my 2nd party I've done – the first was A Dead Man's Chest. I am amazed at how great they turn out! The first game, I had people back out, and had to recast for the very minimum crew of people for that party. But this one I had more than enough people -- everyone found out, and I had to promise I'd have another one, for the ones I couldn't invite to this one. Everyone who comes just loves it!" "Many thanks for all your help, and for providing such an entertaining murder mystery in The Night before Christmas! The party was a huge success! Definitely takes a lot of planning, but in the end it was well worth it. Other friends found out about the one I held on Dec 15, and they wanted me to do another one for them... so I'm having another one this Saturday! I'll definitely be back for more murder and mayhem! Thanks!" "Thank you very much for your quick response to my question. The Night before Christmas was our first murder mystery game and we had a great time. Everything was well planned and laid out and everything we needed was included in the kit. We enjoyed it so much that we are doing it again (with a different group) for Valentine's Day!" 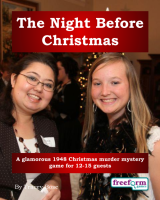 "Just before Christmas this year, my sister and I decided to host a Murder Mystery Party for close friends and family. As we had quite a large group to invite, The Night before Christmas was the best solution. We had previously enjoyed many of the boxed Murder Mystery games, but found that the unscripted element made for a more exciting evening (including one rather dramatic death scene). Everyone threw themselves into their characters and thoroughly enjoyed the evening. There were even requests to make it an annual event!" "We loved it and will play again." "Like the other games that I have run, everyone left the house asking when the next one will be run…"
"The Night before Christmas was a terrific party. The story line was sophisticated enough to engage everyone but not so complicated that we didn't all get into it. My family had a blast and wanted to do it again the very next day (not practical). I'm sure we will be doing other events of this type in the future when we can get everyone together. Good fun was had by all." The Night before Christmas is a dinner party murder mystery game for 12 to 15 guests and a host – download the free introductory pdf file. In The Night before Christmas, the stage is set for an innocent family gathering, with a few friends and strangers added to make the party go with a swing. However, not everyone is as they seem -- some have dark secrets they need to keep hidden... and someone is the killer. You will be in the middle of the action and it will be up to you to wheel and deal with the other guests. Can you achieve your goals, keep your secrets hidden and survive The Night before Christmas? It's up to you. It is December 24, 1948. The socialite Evington-Browne family and guests are preparing for the annual Christmas Eve cocktail party, held by tradition at the family's hunting lodge in the White Mountains north of Boston. Snow has been falling for days - a blizzard has now set in - and the party finds itself cut off from the rest of the world. This is unfortunate, as the valet of one of the guests has been found dead in the kitchen! It looks like a heart attack - but is it murder? Can you achieve your goals, keep your secrets hidden and survive The Night before Christmas? It's up to you. Who has been wearing a Santa Suit to sneak around? Who will inherit the Brilliant Diamonds? Find out in The Night before Christmas! The Night before Christmas lasts for about four hours and is suited to an evening. It is often played over a meal – a finger buffet if possible to allow guests to circulate and talk in private. "I loved The Night before Christmas – the pdf packet included everything I could have possibly needed to run the game smoothly. And I liked that there was more to the story than just solving the murder. With the multiple storylines, everyone got the chance to have a key role." Important note: The Night before Christmas is an alternative version of one of our other games, Dazzled to Death. The characters and the plots are the same, so if your guests have previously played Dazzled to Death, they'll know the secrets of The Night before Christmas too! The difference is that The Night before Christmas is written specifically for a Christmas setting, while Dazzled to Death is suitable for any time of year. The Night before Christmas is unlike many murder mystery games. Although the game starts with a death, most of the characters have more important things to do than to investigate it. And the killing may not be over – it is unlikely that everyone will survive the remainder of the evening! The Night before Christmas is played just like a murder mystery game. You may be trying to solve the murder, but primarily you are (initially at least) concentrating on your own goals and objectives. Unlike most boxed murder mystery games, The Night before Christmas lets you decide how to achieve your goals and thwart your enemies. "The Night before Christmas was brilliant! Our first murder mystery game, but definitely won't be our last." The Night before Christmas costs £20.00 (GB pounds) or US $29.99. You can buy it in either currency, from anywhere in the world, as you prefer. The price will be converted back into your own currency for you, at today's exchange rate. We offer a Cast Iron Guarantee on all our murder mystery games. If you're not completely satisfied with The Night before Christmas then please let us know within 30 days and we will refund you. See our full terms and conditions here.